Recently published by CSIRO and with Crawford Fund sponsorship, we report here on Dr John Moran’s manual on tropical dairy farming ‘Blue Prints for tropical dairy farming: Increasing domestic milk production in developing countries’, written in collaboration with Dr Philip Chamberlain. John Moran is Director of Profitable Dairy Systems in Kyabram, Victoria. 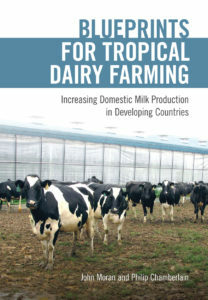 His book provides guidelines for the regional development of both smallholder and large-scale, intensive dairy farms in the developing tropics. While smallholders are the major suppliers of milk in the tropics, many large farms are being established throughout the tropics to satisfy increasing local demands for fresh milk. Both types of farmers and their advisers will gain much from this manual—and improve the productivity, welfare and milk quality from their dairy herds. The manual covers a wide range of topics primarily related to sustaining dairy production systems in tropical developing countries. It was written for all stakeholders in tropical dairy production systems, but with an emphasis on South and East Asian countries. All tropical countries have pro-active programs to increase local supplies of milk, which require increasing numbers of well-trained workers to service their dairy industries. This book aims to keep educators from agricultural schools, universities and technical colleges abreast of the latest technical developments and applications in dairy farming. Policy makers and senior management should also benefit from selected chapters. You can learn more about this book here and for other titles, including John’s 2015 Cow Talk publication, click here.